About thirty of the boys were bussed down to Brighton dressed as policemen. We were going to recreate the Mods and Rockers scenes of the early 60s. Mobs coming up from London to fight on the beeches. Running and chasing around the woods until the sun came up. 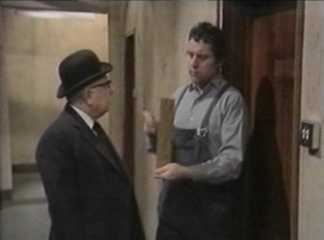 Only had one days work on this and it was great to work with Mr Arthur Lowe. The BBC phone me up one day and ask me what Im like at boxing. They say What about shadow boxing and they tell me all they want someone to shadow box so they can see the shadow on the wall. They gave me the day to work some time in winter. 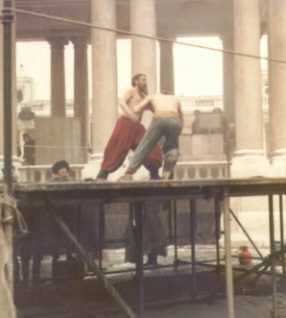 About a week later they phone again and ask me if I could bring a boxing friend along with me on the day of filming. (A friend to shadow box???). I got hold of Ronnie Woods and he was glad of a days work. 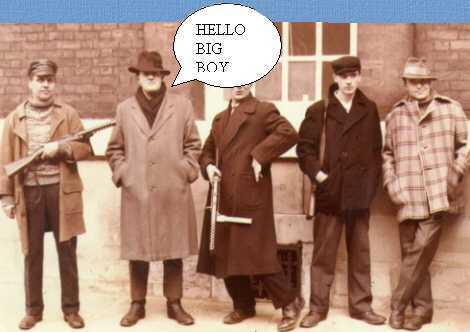 It was snowing and freezing cold and Aitch and his mate are going to box for for the hoards. They were all dressed up in bundles of ragged clothes and were as warm as toast. Ronnie and I were stripped to the waist and had very long beards stuck to our gobs. I had a word to the powers that be and got an increase in our contract. (Also a bottle of brandy for the corner bucket). After a few rounds and a few nips of the Amoss and Andy we were really beginning to enjoy the day. 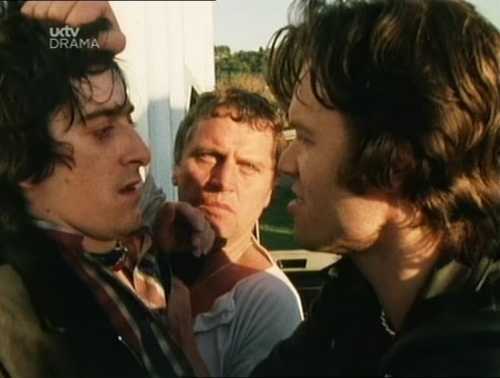 John Hurt was doing the real business of acting some way from us and I dont think I said a word to him all day..
We had a few bruises but it wasnt till the next day that they hurt. Ive stayed friends with Ronnie over the years because he is one nice man. All I have to do in this film is to tie Barbara Hershey to a stake so she can be shot by the firing squad. She even refuses the blindfold. Still, it was a nice sunny day for a firing. On location we filmed the exterior of the hotel. Aitch and Joe loading a huge basket Into the back of a van and driving off. 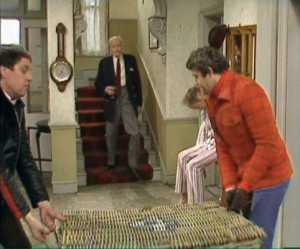 A fortnight later in the studio we enter and pick up the basket which contains a dead body. (But we dont know that) . I met John a few years later and he ask how I was doing. (Nice man). Click on the picture for video clip! 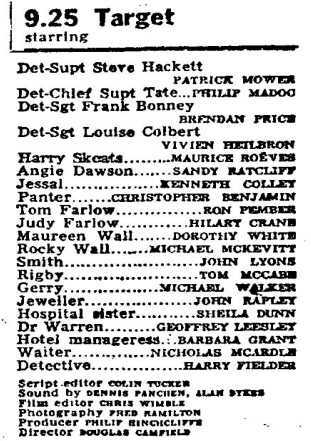 Odd days on this 13 part series set in London in the 40s. 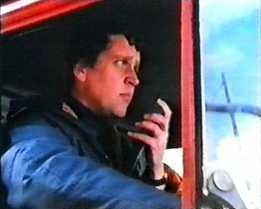 I get a call from Peters office to ask if I have a HGV Licence for the episode 'On The Move'. I tell them, no, but I know a man that does. ( Ridgewell Hawkes). 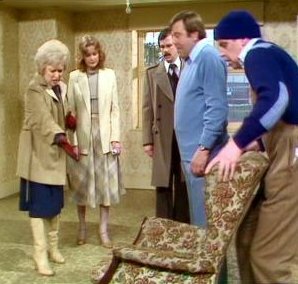 We all had great fun filming the exterior shots and when it came to the studio stuff we had rehearsed at the Acton Hilton for a week I was taken aback when, in one scene in front of the live audience, I had to put back a chair just as Terry was about to sit down. Perfect timing and the audience applauded and cheered. I didnt expect that and it threw me for a couple of seconds. 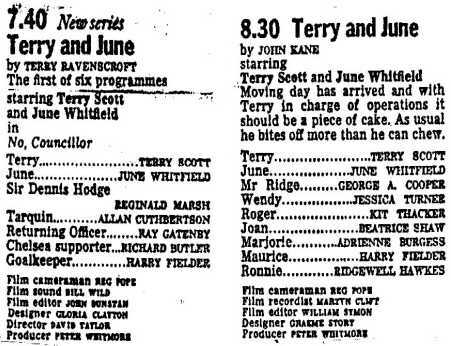 Alas Terry has since passed on but June Whitfield has gone from strength to strength. Nice to work with Patrick and Douglas again.. I dont know if Im more nervous of driving the lorry or saying the words but doing them at the same time was really hard. I ended up in Ealing studios a fortnight later dubbing my own voice. Im off down to Bristol and Western Super Mare for ten days to work on this. Im playing a baddie and Christopher Biggins is my boss. Also in the cast are, Toyah Wilcox, Chris Jagger (Micks brother) and Gary Holton. Gary was to go on and star in Auf Wiedersehen Pet. My main job on the show was to look ugly and hassle Gary and to make his character behave himself. A slap here and a slap there. In one night scene I throw him off the pier into the sea (Two takes) at Weston-Super-Mare. I spent a lot of time on the beach with those lines. 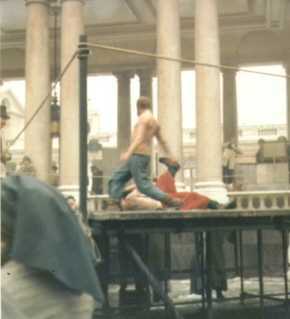 HERES A PICTURE OF A JOB I WAS ON BUT I CANT REMEMBER WHAT IT WAS. 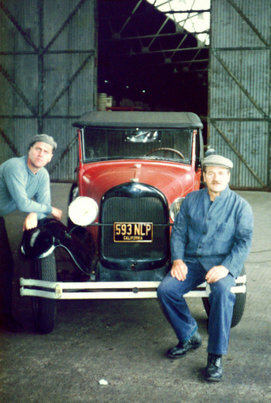 THATS ME ON THE LEFT AND JOE SANTOS ON THE RIGHT.